Good sign - A vegan-friendly new restaurant is set to open in Harrogate. 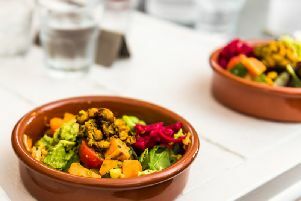 The crazy merry-go-round that is Harrogate's dining out scene may be about to take a turn for the better with a brand new healthy restaurant which prides itself on its vegan and veggie offer - among other things. Set to open in the Everyman cinema complex on Albert Street/Station Parade, Farmhouse is local and will be the first of its kind. Using seasonal produce morning to night, the new restaurant promises impressive vegan and veggie sections on its wide menu - plus wine tasting evenings, coffee tasting and more. Opening on April 12, Farmhouse is currently looking for "super talented and passionate waitresses and chefs to join them creating great hospitality." On the menu will be dishes such as Peri chicken kebab, turmeric spiced couscous, chopped salad with a homemade peri sauce on the side plus Yorkshire reared flat iron steak, sous vide and served pink with a pan mushroom sauce, frites and watercress. The veggie and vegan section at Farmhouse will include vegan Tofu and miso noodle soup bowl and a three bean chilli (vegan) with chilli, brown rice, fresh avocado coconut yogurt, fresh tortilla chips and chilli plus vegan sweet potato Buddha bowl with wild rice, Cajun sweet potato, pickled beetroot, broccoli, kalette, beetroot hummus, pink pickled onions and alfalfa sprout. The new restaurant will also serve breakfast, including American style pancakes, blueberry compote, banana - again vegan.